Greetings PCEP Partners! The October/November 2015 Newsletter update has stories from the Republic of the Marshall Islands, Pohnpei, and Chuuk. Enjoy reading these reports from the past few months! Also check out our web portal for some new updates. Please send comments and questions to Emerson (odangoe@prel.org). 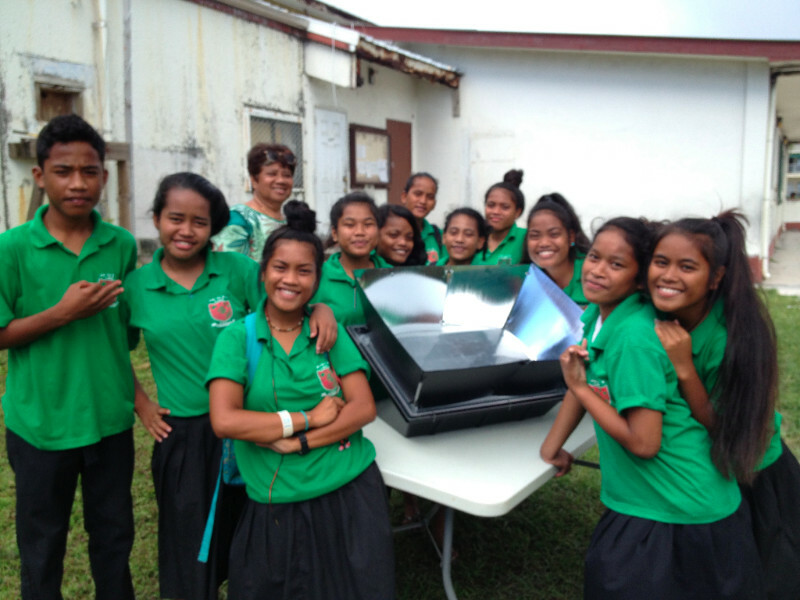 The Learner Maker Space at Life Skills Academy (LSA), Majuro, Republic of the Marshall Islands began energetically with solar cooked meals. This Space is a lab for the “Food, Energy, & Water – Leveraging and Organizing Towards Self-sustainability” project, a joint supplemental grant to Water for Life (WfL) and PCEP. The learner-maker-space model is based on the standard maker space approach of a gathering point where new makers (students and novices) and experienced makers (community experts) connect and work on personally meaningful projects that translate into community-oriented solutions. The learner component here will involve participants in active, deep inquiry through hands-on design, fabrication, and creation into the fundamental science-technology-engineering-mathematics (STEM) principles that underlie and enable their projects. For example, learner makers will jointly explore the essential principles and fundamental concepts of energy transformation, learn the biological and chemical underpinnings of composting, and investigate water contaminants and their impacts on plant and human health. Learner makers will use locally available resources, including recycled materials, as they investigate how to actualize their STEM learning to better harness the Sun’s power toward providing more locally produced food and higher quality drinking water, which are important components of climate change adaptation. Promotion of intergenerational learning and co-production of knowledge. In collaboration with Pohnpei Department of Education (PDOE), Science Curriculum experts, PREL staff, and the PDOE Science Specialists have formed a 12-members Pohnpei Teachers Learning Community (PTLC) with teachers who participated in the Developmental Approaches in Science, Health and Technology (DASH) program professional development in 2013–14, as well as with other science teachers. Representative schools include Lukop, ESDM, Saladak , Awak, Nett, Kolonia, Ohmine, Sekere, Sokehs Powe, Palikir, and Pehleng elementary schools. The purpose of this learning community is to enhance learning about climate education in Grade 1–8 classrooms through professional learning opportunities to build the PTLC members’ capacities as teachers and trainers of other teacers and to improve their skills to implement national and state standards and adapt locally-relevant climate science resources, particularly PCEP and WfL resources. The PTLC will work to build and increase community-school partnerships. Teachers will integrate hands-on, place-based, project-based learning to enhance classroom learning through working with community climate adaptation partners such as the United Stated Department of Agriculture/Natural Resources Conservation Service, Pohnpei Climate Change Outreach Committee/Local Professional Learning Community members, Island Food, Department of Agriculture, Land-Grant program, and others. PDOE has approved the meeting of teachers once a week to work in group clusters to develop lesson plans to trial out in their respective classrooms. PREL staff and PDOE science specialists will provide support and assistance as needed. 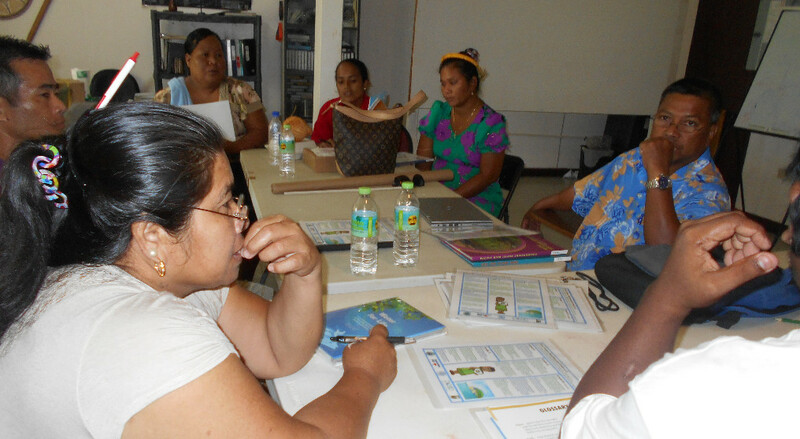 The Chuuk Women’s Council held its 2015 Annual Conference on September 15–17 at the Truk Stop Conference Room in Mwan, Weno in Chuuk State, Federated States of Micronesia (FSM). The main theme for the 2015 Annual Conference is “Tongen Inepwinéú” Love of Family: Working Together to Build Capacity, Resiliency, and Sustainability in the Face of Climate Change Adaptation.” Throughout the three-day conference, presentations were based on topics such as Climate Change, Preparedness, & Recovery; Water Security & Sanitation; Food Security & Nutrition Healthy Lifestyle; and Impacts of Climate Change, Improving Housing, & Water System for Typhoon Shelter. There were more than 100 participants, mostly women, from the different islands in Chuuk Lagoon. Presenters were summoned from the different agencies and departments in Chuuk such as the International Organization for Migration, Public Health, Environmental Protection Agency & Sanitation, Red Cross, College of Micronesia-Land Grant, FSM National Government, and PREL. The main highlight of the three-day conference was that it was an opportunity for many of Chuuk’s women to come together to learn and educate themselves about the different issues in Chuuk and how to face the challenges and impacts of climate change in our islands. There was a lot of singing, dancing, and sharing of skills and knowledge amongst the participants. More information about the conference is available on the CWC blog under the entry titled “2015 CWC Annual Conference Summary Report”: http://cwcfiinchuuk.org/index.php/blog2. One of the newest resources that we have uploaded to the PCEP Resources webpage is the Pacific Climate Variability booklet. This resource provides answers to questions such as, “What does the term climate variability mean?” and “What are the causes and effects of climate variability for Pacific island communities?” This informative booklet discusses phenomena such as the Intertropical Convergence Zone and the El Niño Southern Oscillation in a way that is accessible to a broad audience. We are always adding to the PCEP web portal at http://pcep.prel.org. Go check out the new resource we added this month! Copyright © 2015 Pacific islands Climate Education Partnership, all rights reserved.